Apple's supply chain orders are showing signs of such an increase that Brian White from Ticonderoga Securities predicted how Apple might have had its best November sales ever. He follows an index called "Apple Barometer", which is a self-made list of Taiwanese manufacturers that supply components for Apple's gadgets and derive a lot of their income from that business. Supply chain sales there have increased 17% compared to October, whereas they have been growing 2% on average for the last few years. This, according to him, is indicative of how Apple might log in its best quarter ever this holiday season, buoyed by the availability of the iPhone on more carriers, in more markets, and at various price points. October was relatively weak in supply chain sales, as people were waiting it out for the new iPhone, and this got reflected in Apple's stock price. Because the people who bought the iPhone 4s are kinda... "loyal" and blinded by apple marketing. I don't mean to start a fanboy fight but it's true. Lot of people not being blinded by the Droid marketing anymore and buying a reliable and high quality phone like the 4s. 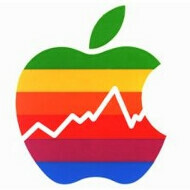 Apple's trend is getting better and better every year.. I hope with all their profits and cash, they can come up with something bigger and better.. 4S is a garbage.. I'm sure he means it being "garbage" because compared to the 4, there's not a whole lot different and compared to other phones it's just not following trends. *by trends I mean phone trends, LTE, Larger screens, better build, etc. iPhones are the trendiest phone in the market. as a litigation lawyer, I'd like to say, "thank you APPLE!, now pay up." For a litigation lawyer, you're pretty dumb :) And for a litigation lawyer, you sure do have a lot of spare time that you spend on here. Don't you have any litigation cases to work on? Lol. no you flaming troll from rainbow troll hell, i have that Q1 2012 bet with taco over sales. the more apple sells now, the less they sell in 2012. Of course with taco lookin like he's perma banned, i guess the bet is off. You mean like the HTC Evo that hasn't been redesigned since 2009? or The old old Droid 4?? Every time they upgrade an Android phone it becomes faster and more capable... If the iPhone is as smooth as everyone says (and I agree) then adding a dual core cpu really didn't do much of anything unless you are gaming on the device. Don't even try to make that argument. Every time they upgrade an iPhone it becomes faster and more capable. Same for every phone. Every time they upgrade a wp phone it becomes faster and more capable. Same for android, i think. Are you rly saying the hardware of the iPhone only changed with a dual core cpu? And that's only gonna improve the performence of gaming? Pls don't comment like you know the iphone hardware from the inside out. If the iPhone doesn't lag at all what became faster? Android phones do lag, so by improving the specs of the phone there is a noticeable performance increase. I'm not saying I know anything about the hardware on the iPhone. My point is that if the iPhone supposedly doesn't lag then what improved by adding better specs? Please don't comment like you read my post when you clearly read the first sentence and started hyperventilating. Wtf Are you saying. I read your first sentence, yes, and also the rest. Are you blind? but I also talked about your knowledge being none existence. You're just so stupid to think specs are everything and the OS can be solved by just adding better specs. So when you got a quad core on a phone then it won't lag? And of course there are things that improve when you got better specs. Maybe one day we can compute the meaning of life on phone (endless calculations). Once again, I never said that specs are everything and I never said the "OS can be solved by just adding better specs". You clearly have terrible reading comprehension, i'm sorry. There is obviously no point in me even trying to argue with you because you either aren't reading my post or as I said above you just don't understand. You never said you never said. You did said it implicitely you said it. Read pls what you've written, compare to what I said. You never make a clear statement. Mostly you are saying That guy said this, not that. That's not the argument we used it's this. While that argument was been used before but you didn't noticed. And I'm not talkijg only about this article almost in every article. I don't hear your opinion very much, mostly I hear other opinions that you copy paste from whatever and changed it z bit. Maybe my reading comprehension isn't as good as I thought because that made little to no sense. "You never said you never said. You did said it implicitely you said it. Read pls what you've written, compare to what I said." What does that even mean? If English is your second or third language I apologize for being rude, otherwise you need to go back to school dude. And yet you quote only the start of it. Now that's a comment iamcc. Finally something I completely understand, and that's not talking about a first quote of me. Now allow me to quote something. "iphone 4s is relatively unchanged to the iPhone", yes it is the design. And I know you gave the iPhone some credit, but that's not the point. The point was that you only talked about the dual core CPU proccesor as a little change. I'll be generous so I give you an example of other hardware they improved. They made an antenna to intelligently switch between CDMA and GSM. (didn't had on 4). Second proximity sensor improved. Third the lence aperture of the camera also improved, etc Now pls reply on me. Did you know this? Or did you only know the part of the Dual core CPU processor? So an analyst that probably just purchased stock in October and desperately needs to make money and has no real time access to any Apple sales information thinks they had their best November ever. How is this news? I wonder how many they sold? I wouldn't be surprised by as many as 10 million. The iPhone really is getting more popular. More people talk about it and the more it's seen, more people will want it. It's a great phone and it's a great status symbol.